One of the oldest streets in Preston to commemorate a trade was Salter Lane, used by the salt dealers who obtained most of their supplies from Saltcotes near Lytham. Here the sea-water was evaporated in shallow sand pans and the extracted salt was stored in special huts or cotes, hence the name Saltcotes. Salter Lane is now North Road, but the name is retained in Salter Street that runs parallel with North Road. An old building that survived until the recent town centre redevelopment was the Dispensary, established in 1809 and maintained by voluntary contributions. Prior to this, on or near the same site, was the surgery where the method of dealing with all illnesses was by bloodletting. The instruments which were used here are now in the Harris Museum. The building was situated in Surgeon’s Court off Lune Street. Also connected with the surgery is Guy Street, pertaining to Thomas Guy, a prosperous businessman who, in the 17th century, bequeathed £300,000 for the erection and endowment of the renowned Guy’s Hospital in London. Textiles, especially cotton, should be expected to have some influence on the naming of Preston’s streets. Cotton Court off Church Street is the only one that specifically uses the name. Near Cotton Court was Bengal Square, and adjoining it was a cotton mill owned by David Ainsworth Catterall & Co. Some of their raw cotton was imported from Bengal, hence the name for the square. Preston’s own Richard Arkwright, whose spinning frame preceded Compton’s, gets no mention in street names, the only reference to him being in the name of Arkwright House where he experimented and finally built his spinning machine. There is an Arkwright Mill in Brook Street, but this is related to Daniel Arkwright, the son of a wholesale grocer. Daniel was in partnership with his brother-in-law, John Parkinson Parke of Withnell. Before this he had worked in a mill for several years up to 1839. In 1852, Daniel started up on his own account with his mill in Brook Street. Another pioneer of the cotton industry was H. C. Outram who started the Manchester Mill in Moseley Street off New Hall Lane and gave the name to adjoining Outram Street. This mill was taken over by J.R. & A. Smith who owned Peel Mill on Fletcher Road. They gave their name to Smith Street which, together with Shuttle Street, housed some of the firm’s workforce. Smith’s Recreation Ground, in the London Road district, was a gift from Alderman John Smith, a director of the above firm. The processes used in the manufacture of textiles, mostly before cotton was introduced to Lancashire, are to be found in the names of several streets. Tenterfield Street is on or near to a field called Tenter Hey where the cloth was put on frames or tents for stretching and bleaching. This field adjoined the Starch House that names Starch House Square. Nearby was the sizehouse, naming Sizehouse Street off Walker Street, and there was another off Friargate, situated in what is now Sizehouse Yard. There was also a sizehouse at the corner of Castle Street and the appropriately named Sizer Street. Kay’s Linen Mill was in Kay Street off Marsh Lane: Kay was a Prestonian who introduced an improved method of spinning flax. Also off Marsh Lane is Leighton Street, named after the linen mill of William Leighton. 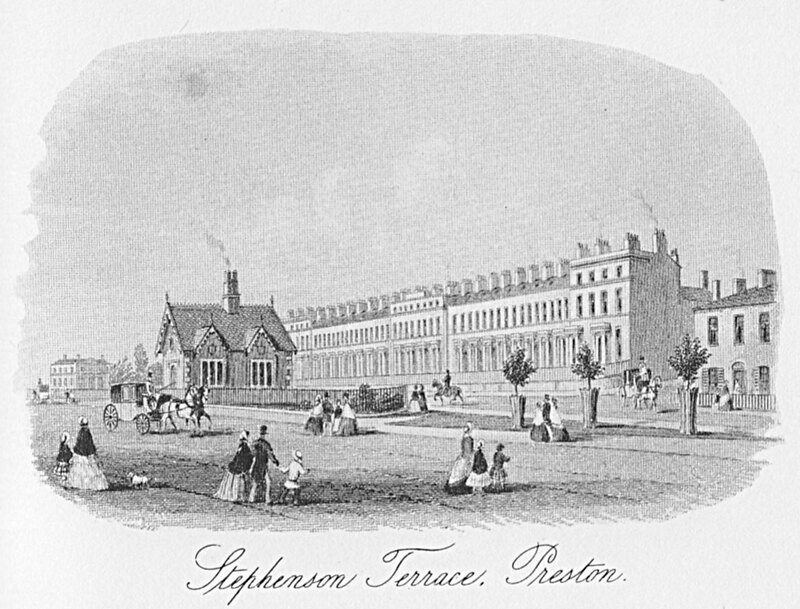 This later became Margerison’s Soap Works. Seed Street and Seed Court, off Heatley Street, and Seeds Yard, Friargate, refer to another Prestonian whose contribution to the linen trade was ‘Seed’s Patent Presser”. The only other reference to the linen trade in Preston’s street names is Flax Street off Fylde Road. There are, or were, three streets in Preston with the name Glover. While it is possible that they were derived from a personal name, the fact is that the name itself originated from the trade of glove-making, one of the early staple trades of the town. The town centre has its Glover Street and Glovers Court, while there was another Glover Street off St. George’s Road but this has had a name change to St. Anne’s Street. Strutt Street off Peel Hall Street housed a small factory which made and supplied healds and reeds to the cotton mills, the street taking its name from the Strutt family whose inventions and modifications to textile machinery were mainly responsible for the industrialisation of the cotton and woollen trades; Jedediah Strutt, born 1726, was apprenticed to a wheelwright but, through his brother-in-law, William Woolatt, he was induced to try his hand at improving machines used in the stocking knitting trade. His first major success was the Strutt Derby Ribbing Machine and, with Woolatt, he opened a factory in Derby in 1758. In 1762, they took in Samuel Need as a partner. Richard Arkwright had previously consulted Need as to the possibilities of his spinning machine, but it was Strutt who realised its value and suggested some minor modifications. 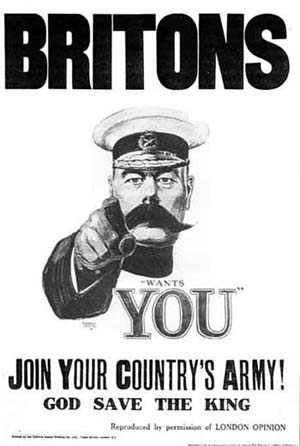 They opened their first, horse-power driven, cotton mill in Nottingham under the title Arkwright, Strutt and Need. Strutt’s eldest son designed the Calico Factory in Derby and devised a self-acting spinning mule. Factory Brow was the former name of the hill on Manchester Road, named from an early cotton mill. Mill Street off Croft Street and Mills Street off North Road (now called Acton Street) also refer to cotton mills. Mill Hill off Fylde Road and Mill Bank, Church Street, were sites of windmills that were once a feature of Preston’s skyline. Mill Fold on Moor Lane refers to the windmill in Cragg’s Row which is the only one still standing but, of course, minus its sails. Mill Lane, Fulwood, relates to an old corn mill originally known as Hatch Mill. William Hatch is recorded in a Court Leet presentment of 1705 as the owner. The mill was entirely powered by water from a nearby dam on the Savick Brook. An additional dam higher upstream was made later. The mill was demolished about 1879 and the dams filled in. For several years before this was done, the mill was known as Cadley Corn Mill. The miller’s house, Millbank, was demolished in 1930 to make way for a new housing estate, the name being retained in the adjacent roads or closes of Mill Bank, Mill Gate, Mill Croft, and Mill Haven. Foundry Yard behind London Road was the site of a small foundry. Iron smelting was also carried out in earlier times in the field by the Moor Brook where charcoal-fired bloomeries were used. A cotton mill built on the site took the name Bloomfield Mill and named Bloomfield Mill Street. The brewing of beer and the great number of beer and alehouses that once ‘graced’ the town feature prominently in the town’s history. Preston was considered the booziest town in the country, much to the disgust of Thomas Livesey who, with six other stalwarts, formed a Temperance Society in 1832. Livesey Street off London Road is only about half a mile away from the house in Walton-le-Dale where he lived. Close to Livesey Street, ironically, is Brewery Street, which took its name from a small brewhouse. Neighbouring streets are Hop Street, Vat Street, and Malt Street. Cooper Street may be from a personal name, but the name itself originated from the coopers or barrel makers. One such cooper was Joshua Bamber, who had a workshop in an alleyway off Friargate, later to become known as Bamber’s Yard. Brewery Lane, alternatively called Brewhouse Lane, was the earlier name of Mount Street, so named from a brewery that was built in the lane in or about 1774. The French were not unaware of Preston’s indulgence, which inspired the composer Charles Adam to produce an opera called ‘The Brewer of Preston’. The making of ropes was one of the important trades carried out in the town, borne out by the great number of families with the surname, Roper. Before St. George’s Chapel was built, the lane now called Chapel Walks was a rope walk where ropes were made. The adjoining field was known as Ropers’ Croft and the lane or walkway was Ropers’ Walk. 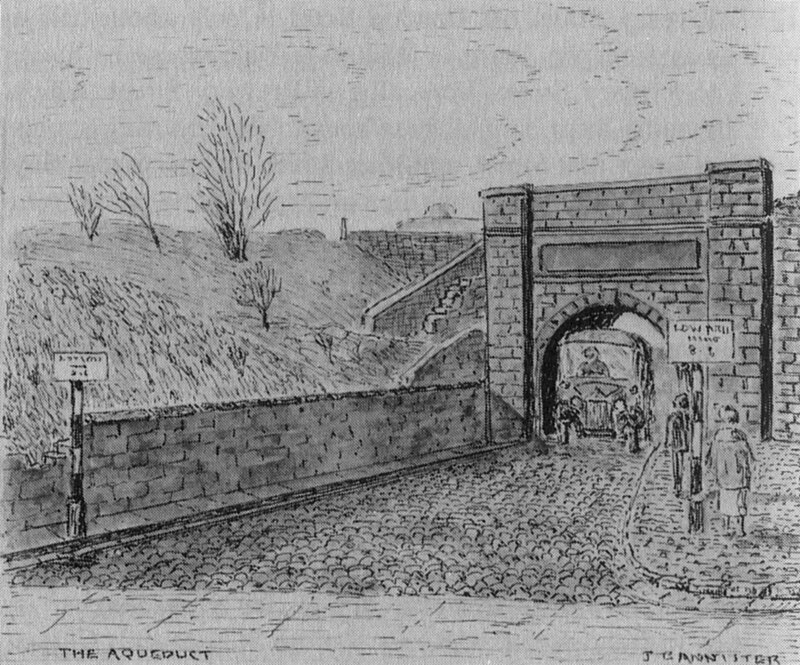 The Aqueduct, which gave its name to Aqueduct Street, carried the Preston-Kendal canal over the roadway. The canal was opened in 1798 and was mainly used by horse-drawn barges for the conveyance of coal northwards and limestone on the return journey. The kilns for processing the limestone were situated near the aqueduct, the name being retained by the nearby Lime Kiln Hotel. The town side of the canal was drained in 1964 and the aqueduct, which was a hindrance to traffic, was demolished shortly after. Timber and stone, vital materials for building, get only a brief mention in street names. There was a Quarry Street off Maitland Street and a Timber Street off North Road. Limestone was brought to Preston along the canal from the quarries in the Kendal District, to be unloaded and kilned near the aqueduct. The kilns were still standing up to the time when the aqueduct was demolished and the lower end of Aqueduct Street was widened. Lime Street, which was nearby has now gone, but the Lime Kilns Hotel opposite the kilns is still there. The Earl of Balcarres had a controlling interest in the limestone trade in connection with his iron and coal business, which had offices and a branch depot in Preston. Coal was brought to the canal wharf from his company’s pits in the Wigan district and transferred to the coal yards in Fleet Street. His connection with the town is remembered in the name of Balcarres Road, off Blackpool Road, which was built on land adjoining the canal earlier this century. Sleddon Street is named after the Sleddon family: Francis Sleddon senior had a foundry and machine manufacturing factory in the street. Francis Sleddon & Son were concerned with the cotton industry and started up in business with Hanover Mill on Great George Street. Also off North Road and behind the Hanover Mill is Emmett Street. Michael and John Emmett were joiners and builders with premises there. In 1781, together with Robert Bailey, and trading as Robert Bailey and Company, they were contractors for the rebuilding of the then new Town Hall adjoining the Old Shambles. They completed it in time for the Guild Festivities the following year.